I like the combination of Catene & car. My day is always happier when there's a new essay by Romy Ashby. Earlier this year Harry Boland's (5th & 9th)was closed for non-payment of taxes, but it opened up again fairly quickly. It's been shut for the last few days. 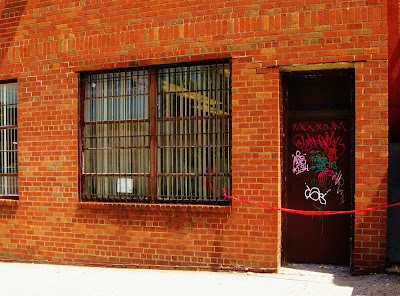 Update (6/7): I saw a Closed by DOH sticker on the door yesterday. 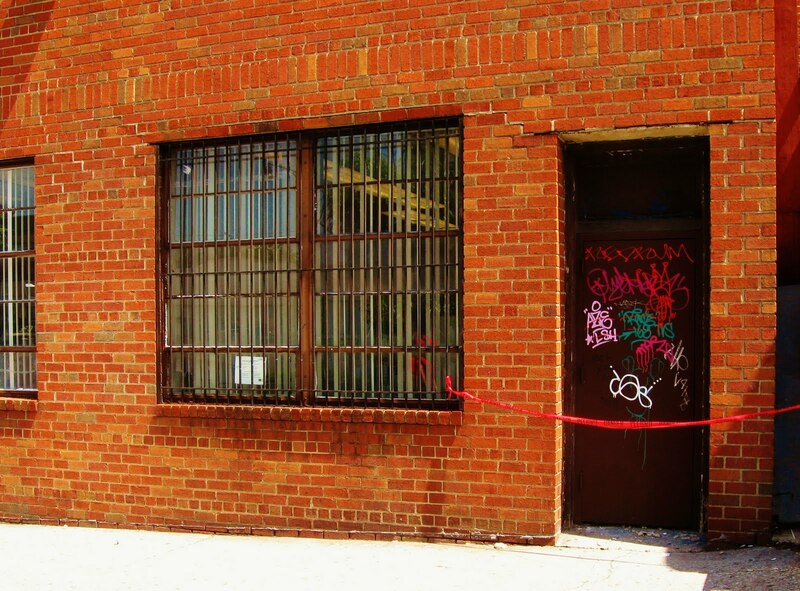 Heard a rumor that 72 Seventh, where La Taqueria used to be, may well house (wait for it) a gelateria. All those gourmet ice cream-trucks, artisanal yogurts stores, & the like, make me think instead of this. Let's hear it for Mister Softee! Coming home from the R, I passed the 13th Street laundomat on Fourth & saw a cage containing two very handsome parrots. They were talking, but beyond "Hi!" it was hard to figure out what they were saying. A hipster couple on their way to Greenwood Cemetery wanted to know if they were Monk parrots & I quickly put them straight (that's about the extent of my parrot knowledge). Over on 17th, I found David, who was embarking on a mammoth front yard display of animal life, with hundreds of big cats, dinosaurs, & their prey. I love this! When my kids were little, I probably had as much fun (more?) as they did creating animal parades with our huge collection of plastic animals. It's good to see someone else getting into it. I'll try & get back when he's finished putting the scene together. A while back I took a picture of the Joan of Arc graffiti by the Gowanus. It was taken from the train. Yesterday I went down to take some closer shots. This is only a short walk from where I live, and at this time of year, I spend a lot of time down here. If you turn down just before the 9th Street bridge, you can get right down to the water and have this place to yourself. Yesterday, though, there were a bunch of kids, all in black, setting off firecrackers. Yesterday I saw Went the Day Well? at Film Forum. The film is a British wartime propaganda number, based on a story by Graham Greene, and in the hands of director Alberto Cavalcanti it breaks out into completely unexpected territory. As the inhabitants of a stock English village fight off German invaders, they cast off all restraints & turn into savage killing machines. Ax wielding, pistol bearing women do their duty, and matriarchs bear the brunt of hand grenades to spare the lives of village children. They're no Fugitive Girls, but still ...The entire Home Guard unit is slaughtered, and even the white-haired vicar bites the bullet. There were a lot of laughs in the audience as the bodies fell. At the Forum, most of the seats bear the names of benefactors. I happened to sit behind Miss Portland Hamlin (A Great Lady & A Great Cat), and Mel Johnson, and a little to the left of them was Fuckerhouse Films. Miss Portland, a sixty something bearded man, & Mel, his wife, were clearly habitual moviegoers, and there was earnest pre-feature talk about the merits of various films. Mel wondered why, in The Blues of the Night, the characters were all so happy to be living in a barn in Weehawken, and found the plot scattered. The leading lady, she thought, was detestable. It was no wonder the guy threw her off a cliff. Both of them admired Lumet, though Miss Portland hated Dog Day Afternoon, and found the characters "garbage". Miss Portland was not swayed by Mel's protests. Who cared if it was based on a real story? "Isn't it amazing that I feel this way? The film is a piece of crap!" This verdict bothered me no end. I was dying to jump in here, in defence of my favorite film, but said nothing. Next to Miss P., Fuckerhouse had no problem keeping quiet. A portly man in a checkered shirt and a wig, he was a sour presence, shoveling in the popcorn & swigging soda glumly. His was the sad face of solitary movie-going, and I saw him leaving as the credits rolled, with his bright white sneakers and pants just a little too short. Not well at all, I fear. Going back along Sixth, the late afternoon light was crazily beautiful. The chattering fools at Bar Pitti seemed oblivious to this (and yes, I do pity them). At West 4th, I stopped to watch a pick-up game for a bit, to catch that light for a little longer, before heading down to the train. A breeze blew away the heat's intensity. The sun's decline made everything rich and evanescent. The day went. Just fine. Yesterday I went back to Jamaica Avenue, via Sutphin Boulevard. 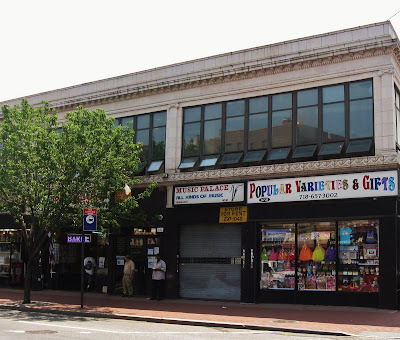 Jamaica Avenue was originally a trail road for Native American tribes, and gets its name from the Lenape word for "beaver". One of the signers of the Constitution, Rufus King (sounds like a soul man to me) settled in Jamaica, & the Rufus King House is a strangely bucolic presence on the avenue (see below). Jamaica was a busy eighteenth century trading post, and later became important as a transportation hub, with major rail, bus, and subway connections. 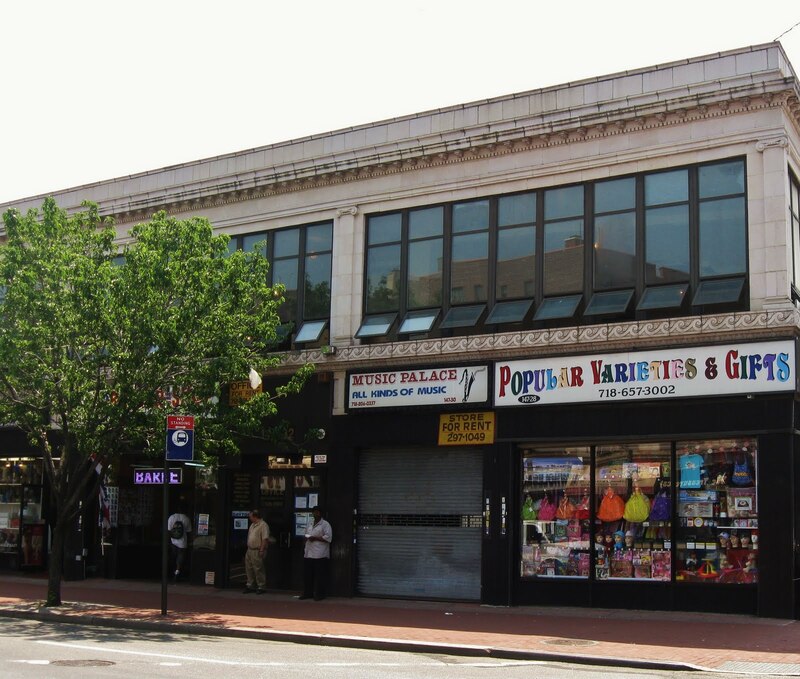 In the 1920's Jamaica was the retail center of Queens, and in the 30's a center of government, entertainment and finance for Queens & parts of Brooklyn, but by the 60's it fell into economic decline. In recent years, there have been a number of economic investments in the area, including the JFK Air Train. Famous native Jamaicans or long-term residents are an interesting assortment, including Jimmy Breslin, Paul Bowles, Mario Cuomo and (oh yes!) Donald Trump. The strong-man guru Sri Chimnoy established his headquarters right around here. A zillion rappers hail from Jamaica, from early Run DMC members to 50 Cent, & Metallica hung out here for a bit. Basketball is represented by Lamar Odom and Ron Artest. In 2006, Sean Bell, an unarmed man attending his bachelor party, was shot dead by police outside the Jamaica nightclub Club Kalua. Here are some of the storefronts or general street scenes I saw during a four or five block walk. I'll repeat myself (again) & suggest that you click on the pictures to see them better. How demure this headgear is, and how old-fashioned the girls' faces seem. The smudges on the tips of their noses are rather heart-breaking too . Wouldn't you like to just reach through the glass with a Kleenex and help them out? Jamaica Ave., has a ton of furniture stores, many of them once-grand showrooms fallen on shabbier times. 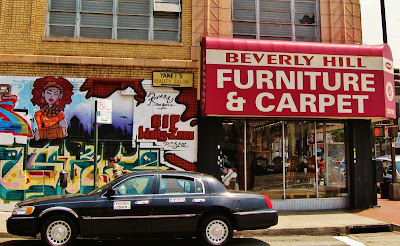 This less fancy one, Alex (Dollar Bill) Furniture has some cool hand-painted signs. I can just see the yups spending a small fortune on the retro dinette ware. I love Santeria stores, and I always have a place in my heart for saints. I've photographed many in the past. The religious statues I found in this Jamaica Ave. store though, are the UGLIEST ones I've seen in my life. Because of the sun, I couldn't take any decent shots, but this one might give you a sense of how unpleasant they are. I'll come back on a grey day to capture the rest. Here's a real contrast to the rest of the Ave., the Rufus King house. I think I've done a little time travel. And now I'm back where I began the tour, on 149th Street, heading back to Sutphin & the dubious pleasures of employment. OK, I wasn't really surprised by this marketing scam, but I was disappointed. Yet more dreams dashed. I find the bottom sign troubling. Saw Booker T at the Bell House tonight. He is coming up to 67 & in great form. The band played a good long set. That Hammond organ! Here's a really old video of Time is Tight (they played it tonight). Grainy, & pretty poor sound, but cool. I wonder how many thousands of times I've found myself at this intersection? You can see the MTA work on the bridge over 4th. Yesterday the Manhattan bound platform at Fourth Avenue re-opened. I'm happy to say the platform doesn't look much different - just some structural work & coats of paint. I'll miss that amazing temporary view (folded up & dismantled with the temporary bridge), & wonder what they'll do when they start working on the other side. Starting next month the Smith & 9th station closes completely for almost a year, with only the grudging MTA offer of increased nightime service on the B61. Update: The bridge will be back in September, according to one of the construction workers at the station. It will again provide access to the temporary platform, which will then be used for Coney Island bound trains. I love the way the sofa matches the building. All those shades of brown & all the stripes. Items placed here used to be for sale, so it's ominous that they're free these days. I'll be sorry when this place gets a makeover. Steve Buscemi Rallying in Support of 11th Street's Engine 220 (PS Patch), one of the fire stations on Bloomberg's hit list. Join the protest on Wednesday - 530 11th Street, 11:00 a.m. - 2:00 p.m.
On a much happier Buscemi note, check out this food pawnshop sketch from a while back, set at the long defunct Stavenhagen pawnshop on Fifth & 16th. Well there may be only pestilence in store for me tomorrow, but I'm going for something a bit happier. Here's the Cimarons, who I met on the ferry to Dun Laoghaire around 1980 or so. A few days later, I ran into them again, in Limerick. Good people. A couple of weeks ago, I decided to spend Friday lunchtimes walking around my work neighborhood, in Jamaica, Queens. Last week I visited the Sri Chimnoy diner, Smile of the Beyond, a favorite spot for Mahavishnu Orchestra hangers on & other assorted oddballs. I was going to put something up, but ran out of time that day & it will have to wait. I'll probably visit some of the other Chimnoy sites in the area, & maybe even get to the late guru's compound, & then I'll report back. Today I took a stroll along Hillside to 146th Street, then down to Jamaica Avenue, and back along Sutphin Boulevard. I wanted to go further along Jamaica, but my forty-five minute time deadline stopped me. This stretch is right around the courthouses, so it's full of lawyers' offices, bail bond stores, and shops buying gold, silver, diamonds, or pretty much the clothes off your back. There's also a huge number of real estate offices, and some interesting looking Central American restaurants. Here are a few scenes from my lunchbreak. The superbly bitchy sounding Envy Nails, Jamaica Ave.
99c Dreams, Sutphin Boulevard. Is there a more melancholy store name anywhere? There's a much bigger 99c Dreams in Red Hook, but I don't know if it's a chain, or if some inspired retailers independently hit upon the same title. The good thing about this place is that it's 99 cents or less. So many of the 99c stores are 99c & up rip-offs, and most of the merchandise is way more expensive. I'll have to check this place out. God is Good All the Time? Oh come on, this is a pawn shop! Cash in a Flash, Sutphin. 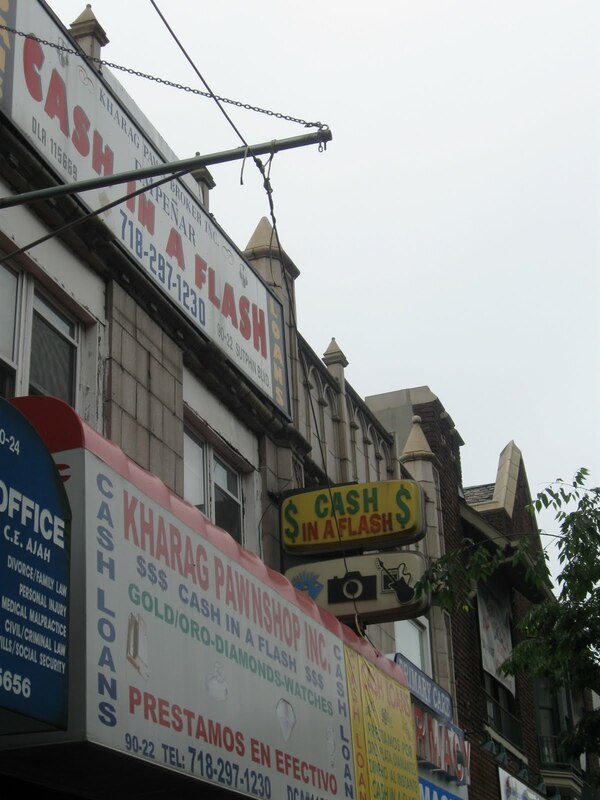 This is also, more prosaically, known as Kharag's Pawnshop. It has a couple of nice 70's (?) signs intact. How about the desperation of handing over that prized guitar for a few bucks? And stereo - huh - what's that? This sliver of a liquor store (on Sutphin just off Hillside) has some great signage, and what I guess might be a liquor license number on the window front. The vertical sign looks a good deal older than the handpainted one, which has some nice curvy lettering, and the kind of bottles that denote some basic alcohol requirements. None of that fancy crap here.